POMONA, Calif. – Harley-Davidson® Screamin’ Eagle® Factory Team rider Kenny Coolbeth finished sixth at the Law Tigers AMA Pro Flat Track Finals, the season-ending race of the AMA Pro Flat Track presented by J&P Cycles Grand National Twins series at the Los Angeles County Fairplex. The race and 2013 AMA Grand National championship were won by Brad Baker on the Dodge Brothers Racing Harley-Davidson. 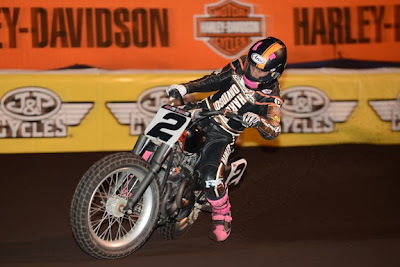 Coolbeth won his heat race and was seeded second behind Baker for the start of the 25-lap National main on the Fairplex half-mile. After one lap the race was re-started following a red flag for a crash by Triumph rider Mikey Martin. On the restart Baker took the lead but was quickly passed by Crosley Radio Kawasaki rider Bryan Smith, the rider closest to Baker in the championship standings. On lap four Baker came close to crashing in turn two and backed off his pace, allowing Smith to gain a half-second advantage. Baker regained the lead on lap 14 as Rod Lake Racing Suzuki rider Briar Bauman and Rodgers Racing/Blue Springs Harley-Davidson rider Jared Mees also joined the lead pack. Coolbeth was in fifth place and gaining on the leaders when the race was stopped on lap 16 for a crash by South East Harley-Davidson rider Sammy Halbert. On the ensuing staggered re-start, Baker took the lead and for the final 10 laps he and Smith engaged in a battle with Bauman also in the mix. Coolbeth could not regain his earlier momentum and slotted into sixth place. Baker picked up his pace in the final laps to lock up the AMA Grand National championship with his second victory of the season. The 20-year-old rider crossed the finish line 0.706 second ahead of Smith. Bauman was third, followed by Mees, Burnett Farms Racing Kawasaki rider JD Beach, and Coolbeth in sixth. The race was the last on the Screamin’ Eagle Harley-Davidson XR750 motorcycle for Coolbeth, who will not return as the Factory team’s primary rider for the 2014 season. Coolbeth joined the Harley-Davidson Screamin’ Eagle Factory Team in 2006 and won the Grand National championship in 2006, 2007 and 2008. Photo's of the First Oldtimer Swapmeet for Pré-1945 Motorcycles in Vellingkermis, Werchter (B) - And Rock Around The Jukebox Autotron Rosmalen, are Online NOW! Photo's of the First Oldtimer Swapmeet for Pré-1945 Motorcycles in Vellingkermis, Werchter (B) - are Online NOW! Op zaterdag 12 oktober 2013 werd in België een beurs voor oude motoren en onderdelen in Werchter georganiseerd door HD-Classic. Tegenover café 'De Zavelbank' in Werchter was de Oldtimerbeurs Vellingkermis, Werchter, enkel voor motoren en onderdelen van voor 1945. Het was de eerste maal dat Hans Devos, eigenaar van HD-Classic, dit originele initiatief nam om in België eens wat voor oude motoren te organiseren. Afgelopen weekend 12 en 13 oktober 2013 vond in Autotron Rosmalen opnieuw twee dagen lang Rock Around the Jukebox plaats. “Herleef de jaren ’50, ’60 en ’70 van de vorige eeuw. Op 12 en 13 oktober is Autotron Rosmalen gevuld met vetkuiven, petticoats en jukeboxen.” En aldus togen wij op de regenachtige zondagmiddag naar het Brabantse Rosmalen om de sfeer van weleer te proeven, zien, voelen en horen.